A farmer plowing his field in the Southern California town of Perris has made a grisly discovery – a body believed to be the remains of a skydiving Russian tourist who has been missing for two months. Vladimir Frolov was last seen when he did a solo jump from a plane on Sept. 25 from Perris Valley Airport. Frolov was vacationing in the U.S. alone, and the 50-year-old man's disappearance was not reported for five days. Authorities found the skydiver's rental car in an airport parking lot only after a friend from St. Petersburg called the skydiving company looking for his pal, reports The Press-Enterprise newspaper. A two-day search by ATV, helicopter, horses and sniffing dogs ensued in September, but failed to find the body. The farmer's field was part of an area searched by helicopter, but was covered with weeds. The farmer told police he did not notice the body until he plowed a row or two away. Along with the remains was a skydiving jumpsuit and both main and backup parachutes, which had not deployed, a police official tells the newspaper. 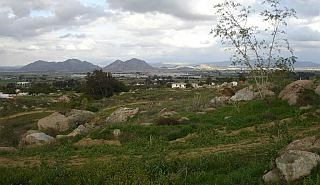 Perris is about 75 miles southeast of Los Angeles.